There is something magical about the margin where the land meets the sea. Of particular interest is the robust group of birds who inhabit this space. The birds in this group are worthy of study. They make their presence felt in no uncertain terms, and themselves tend to a large extent to be bound up in the mystery of the sea. 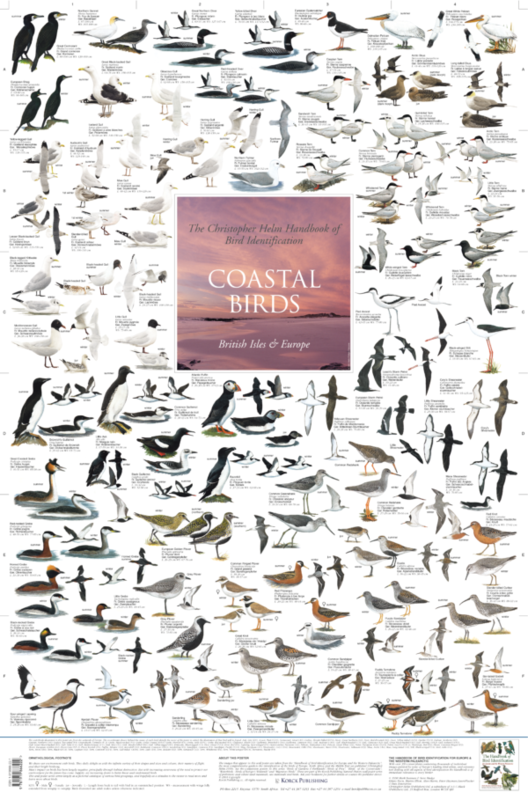 72 different species of birds found along the coastal shores of the British Isles and Europe are shown on this poster. Among the bird families represented are: diver, grebe, guillemot, gull, knot, pelican, petrel, plover, sandpiper, shearwater, skua & tern. Extremely vociferous, many of these, and an indispensable component of a walk along the beach. The superb bird illustrations shown on this poster are from The Handbook of Bird Identification for Europe and the Western Palearctic’s over 350 colour plates containing thousands of individual images painted by some of Europe’s leading bird artists.